Gold and silver investors know that the price will not truly move to their fair value levels until central and bullion bank manipulation stops, or the world enacts a global reset. 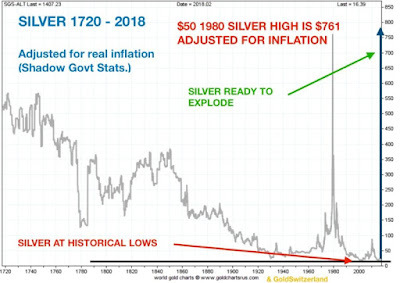 And while the powers that be over the banking system continue to be able to suppress the price in daily trading, what they cannot control is inflation and the inevitable explosion that will occur when the true value for gold and silver one day comes. 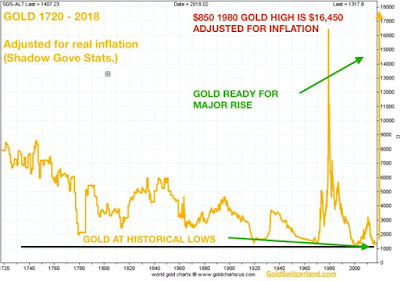 Just as the central banks were able to suppress the price back in 1980 when it had climbed from $35 per ounce to just under $850 (2400%) in less than a decade, so too did gold move in equivalent leaps between 2002 and 2011 ($240 - $1950) when they were unable to control the market following the 2008 financial crash. Now however the environment is much different, and besides the tens of trillions of dollars in money printing that has taken place not just in the U.S. but around the world, global debt has reached a point where it is now 3.25 times annual GDP. 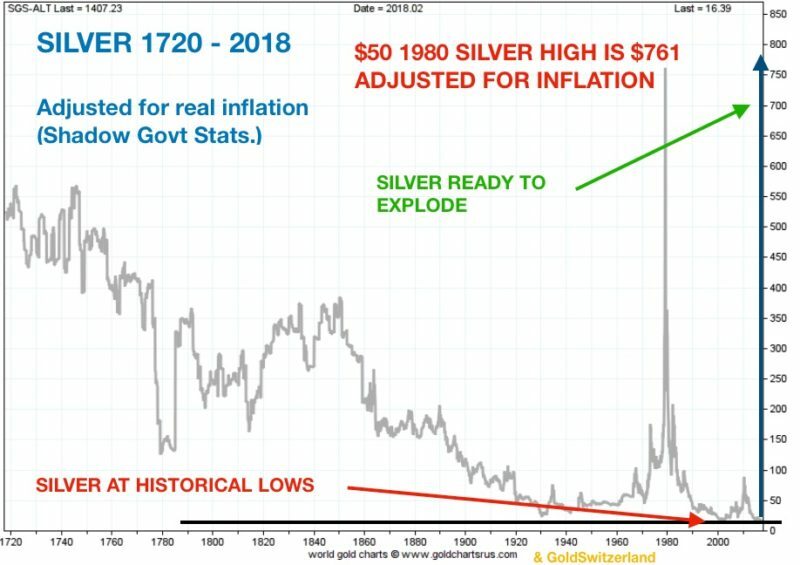 And like in the 1970's when the central banks could no longer control the inflation that emerged following money's removal from the gold standard, one day soon the inflation created from QE (money printing) will skyrocket gold and silver the same way it did in the 1970's and early 2000's. So what should the real value of gold and silver be today if inflation were allowed to freely manifest itself in the global economy? Long time and well respected analyst Egon Von Greyerz has done the research and the numbers point to $16,450 gold and $761 silver. Unlike stocks today, gold and silver are truly a buy and hold investment. And if you think they do not hold any real value or significance in the global financial system, just ask Russia, China, Germany, Austria, Holland, and Turkey what they feel as they continue to either accumulate more gold, or have it repatriated into their vaults. Once the powers that be lose control over their debt and credit monster that they created following the 2008 financial crisis, gold and silver will in a very short amount of time recoil from the years it has been suppressed and manipulated. 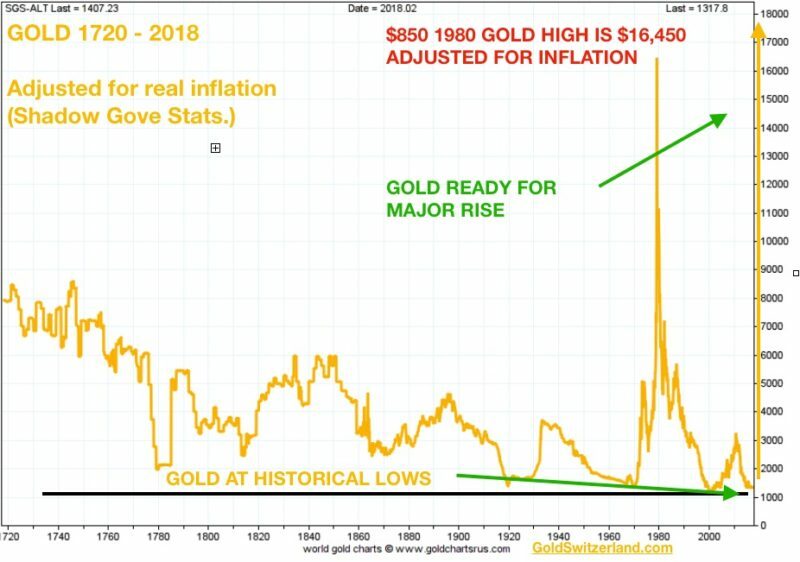 And if history is any example (1980 and 2011), then the above price projections may actually be low, meaning gold and silver are both right now two of the best valued investments in history.